I would have expected better from Dr. Scott Gottlieb, the head of the FDA. He is both sharp and knowledgeable. Which makes it even more astounding that the ban of 7 food additives (artificial flavors) could happen on his watch. I don’t much care whether any of these artificial flavors end up in my tomato soup or not. But I do care that the reasoning behind the ban violates fundamental principles of chemistry and that the message it sends is exactly the same incorrect science that has been successfully heaped on the American public by the organic food industry – that there is any difference between a chemical that comes from a plant, etc. is in any way different from the same chemical that is made in a factory. This is dead wrong. They are indistinguishable from each other. The FDA decision not only contradicts good science but also supports bad science. One of the chemicals in the ban is called myrcene. 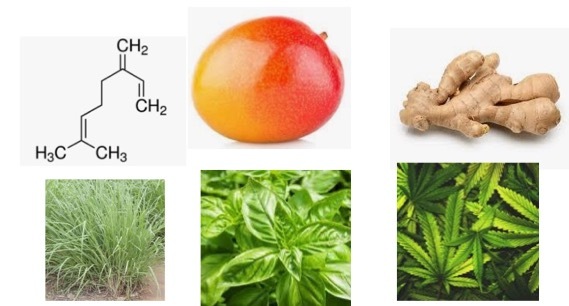 It is ubiquitous in plants, for example, mangos, ginger, lemongrass, basil, and marijuana (Figure 1). Here’s where it gets seriously crazy. 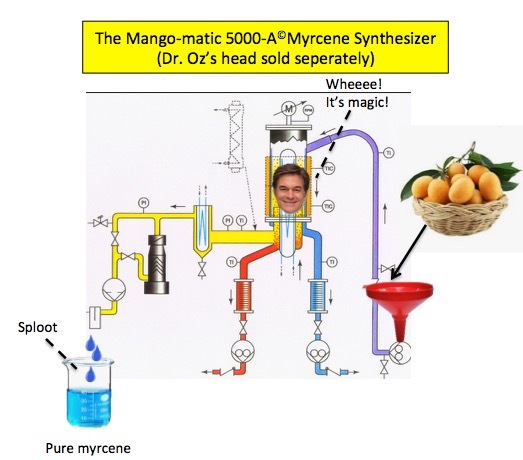 Let’s say you had a magical Mango-matic 5000-A synthesizer© in which you jam in a bunch of mangoes, push a button and out comes pure myrcene (2). Like this one. 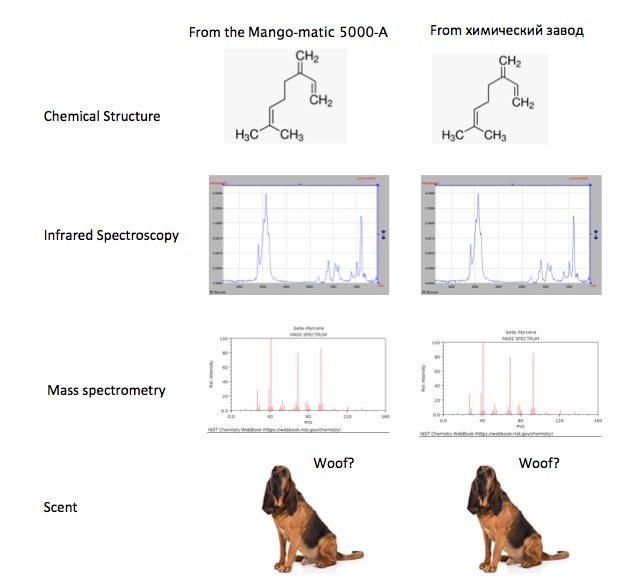 Mango-matic 5000-A synthesizer© myrcene could legally be used as an artificial (1) flavor (additive). But let’s say that you don’t feel like collecting a bunch of mangoes. You could also make your myrcene here. SO, WHO IS BEHIND THIS? “The FDA’s ban is a response to a handful of groups petitioning to have the chemicals more tightly regulated and could affect a number of popular products.? Hmmm. A handful of groups that don’t like chemicals and seems not to like science very much either. Who could these people possibly be? Yep, it’s the usual suspects. A bunch of lawyers, art history majors, and shakedown artists who can’t tell the difference between a periodic table and a craps table. So, it’s not just myrcene that is being “picked on.” It’s seven different chemicals, all of which are naturally occurring, and just happen to be identical in every way to their synthetic counterparts. By imposing this arbitrary ban the FDA is promoting scientific ignorance – just about the last thing this country needs more of. Whoever made this call should be ashamed of him/herself. he terms “artificial” and “natural” are meaningless when the health benefits and hazards are being considered. Your body does not know (or care) where the chemical came from – just its properties. OK, you got me. Myrcene isn’t blue. 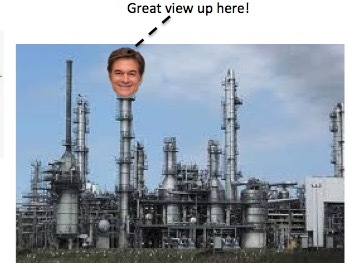 But neither is Dr. Oz’s head actually in the Mango-matic 5000-A©. Assuming 100% purity for each. This article does not address the cancer risks of the seven chemical compounds. Whatever they are is the same, regardless of the source of the chemicals. Copyright of this article by American Council on Science and Health. We are sharing and promoting the market innovation.